LRQA at the forefront of providing new standard transition services to organisations worldwide. 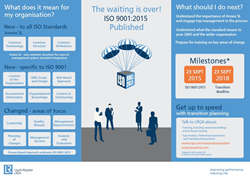 September 23, 2015 marked the end of the ISO 9001 revision process with the publication of the international quality management system standard ISO 9001:2015. Speaking of the publication, Richard Crute-Morris, Assessment Services Capability Development Manager at LRQA, the world's leading provider of independent assurance and professional business services, said, “Now that ISO 9001:2015 has been published, organisations looking to transition to the new standard can really benefit from a performance-based management system which delivers competitive advantage.” To mark this milestone, LRQA has developed an infographic which sums up the changes which can be viewed here. The international quality management system standard is now available from National Standards Bodies and was developed by the ISO Technical Committee ISO/TC 176/SC 2. ISO 9001:2015 has been revised using the common management system framework, introduced by Annex SL which sees the standard structured into 10 clauses – this will be the case for all new and revised ISO standards. LRQA has been actively seeking accreditation globally, in order to deliver accredited certification against the revised standard for the many thousands of clients that LRQA serves worldwide. Until accreditation is awarded, any organisation wishing to complete their transitional assessment to ISO 9001:2015 can do so and will be issued with an unaccredited certificate. Once LRQA has been awarded accreditation, any unaccredited certificate will be reissued. LRQA is a member of the Lloyd’s Register group. LRQA is a leading independent provider of assurance services including assessment, certification, validation, verification and training across a broad spectrum of standards, schemes and customised assurance programmes. For more information about transition to ISO 9001:2015 and the range of services available, email enquiries(at)lrqa(dot)com.